During a trip to Central New York in mid-July, my husband, Dave, and I visit our old stomping grounds, and we return to a spot that was the scene of one sweet gesture many years ago. We stand at the edge of a driveway staring at the home we had lived in until 1999. It is for sale. What would it be like to live here again, to be among old friends with a shared history and memories? Like an old family movie, scenes of our girls growing up here flash before me. Then, as quickly as that thought crosses my mind, I dismiss it. Nah! We’d have to re-do the landscaping, and get rid of the in-ground pool the new owners put in – which is only useful about two months a year in Central New York. Then, who knows what the owners changed inside the home we had built for us? Plus, there’s the matter of our girls, our sons-in-law, our grandchildren, grandpuppy, kitties, grandkitties and our jobs. We couldn’t leave them in Florida to move back here. You can’t really go back. You can’t occupy two worlds – unless you’re Bill Gates or a Rockefeller. So we make the most of our visit. We meet friends at lunch and dinner to catch up on old times. Stunned to realize how much their kids have grown, just as ours have, and the changes in their lives – new jobs, etc. Of course, we have to exercise to walk off all the meals. So we take a few strolls thru Onondaga Lake Park in Liverpool. Since we left, 5 more miles of hiking trails have been added. We sit on the deck by the lake, and it still has that same calming affect on us. 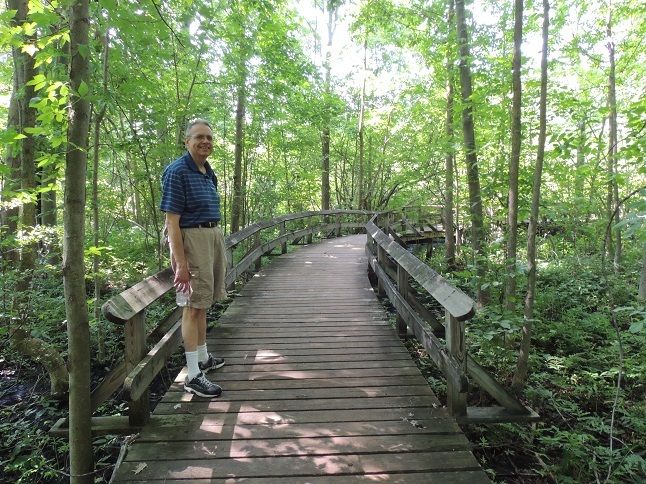 We also return to Beaver Lake Nature Center and hike the 3-mile lake loop. Exhausting in the heat of the day, but also relaxing. Then, we pour our tired bones into deck chairs at the center’s observatory. We chuckle as a little chipmunk outfoxes the bigger squirrels for the seeds that the birds kick out from the bird feeders. A bigger hike looms ahead. 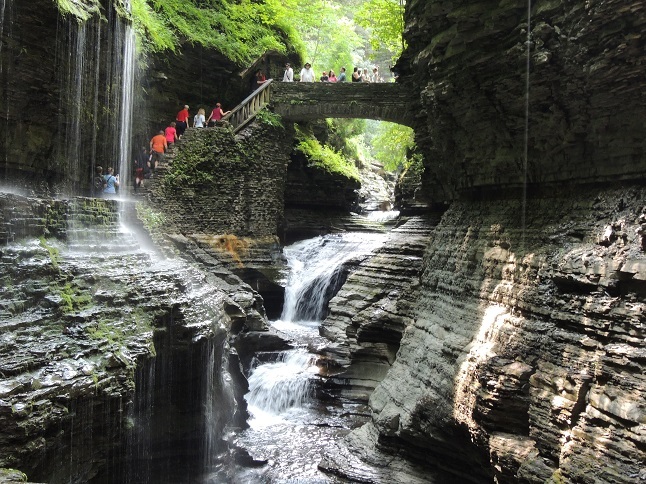 We drive to Watkins Glen State Park, walk 1 ½ miles and climb 832 steps to view some of nature’s most gorgeous work – waterfalls and gorges carved out by ancient glaciers. Breathtaking. Seneca Lake is wine country. We stop at Glenora Wine Cellars to buy a bottle of wine for friends of ours when we return to Syracuse. As we look out over the fields, I am struck by how much it looks like a Monet painting. The wine cask resembles rolls of hay amid the greenest greens you can imagine. That trip offers another treat as well – an overnight at the Showboat Motel along Seneca Lake. In August of 1993, it’s where one of the owners, Larry Jenkins, discovered we were celebrating our anniversary. See story here. 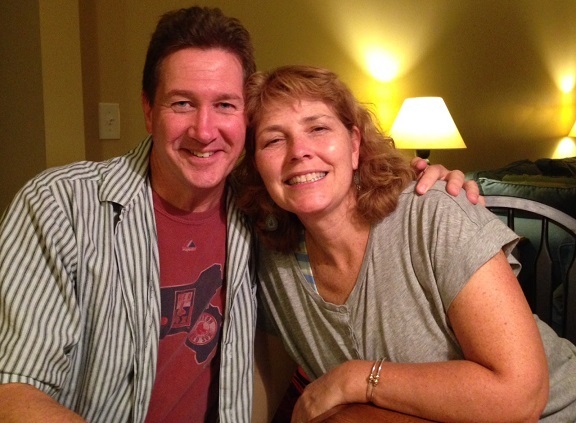 That night, 21 years ago, Larry brought out two slices of Boston Cream Pie – with a lit candle on each one – and invited those at the restaurant to join in singing “Happy Anniversary” to Dave and me. I don’t think I ever told him then how special that one, small, sweet gesture made us feel. But I did this trip. I re-introduce myself to him. Larry looks pleased when I tell him that his thoughtfulness capped the end of a perfect day and is a memory I still treasure. Then we leave for Syracuse. On our last night there, we go to a cookout at the home of longtime friends of ours: Rick and Holly Moriarty. Dave and I have known them long before they married. They were witnesses when we renewed our wedding vows. Now, their daughter is in college and their son is heading in that direction in a year or two. It is a night I wish never had to end. 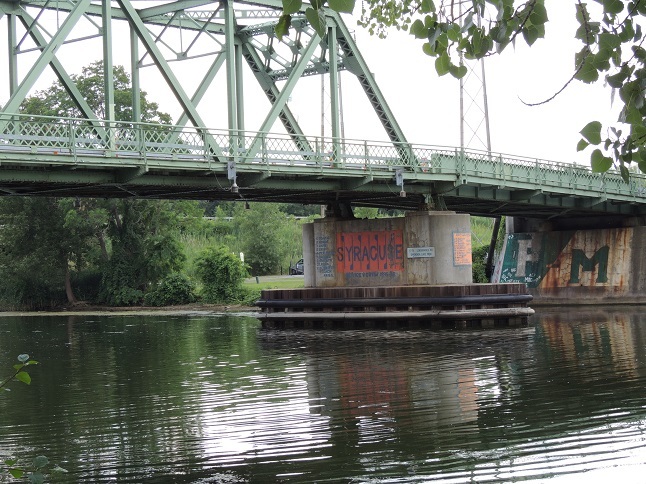 This visit makes me nostalgic for Syracuse, for friends with a shared history and memories. To paraphrase a woman interviewed by Humans of New York: As you get older, there are fewer of those people around who remember you in the various stages of your life. Is there a special time and/or place you yearn to return to – even if just for a visit? Thanks to all our friends in Central New York. We had a great time and we miss you already. We’re sorry that we couldn’t get to see everyone we wanted to. 7. 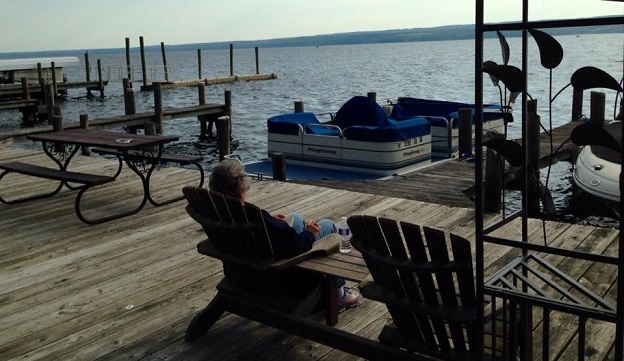 Photo – Showboat Motel overlooking Seneca Lake – Judy Berman relaxing and reading. Taken by Dave Berman, July 2014. Oh Judy. We’ve had parallel experiences this summer. BH and I returned to our old stomping grounds, revisited the cottage in Plum Island where we had our honeymoon, saw old friends and family. And I spent much of the time with a lump in my throat. Not sad, exactly, just aware of how much life has happened already and how much I have to treasure. Beautiful, beautiful post. Judy, this post made me feel so happy. Thank you. I also liked the Humans of New York quote, and it is very true! I lived in north Jersey for a while and loved it. I made great friends and there was so much to do. I have been gone from there for 20 years now and haven’t been back in about 5. When I would go back I would get so homesick for that time that my heart hurt. No, you can’t go back but you can feel the friendship. And how cool is it to have the surname of Moriarty?! I’m glad you enjoyed the ride, Diana. We did have a wonderful visit. Your writing was the perfect venue for a trip down memory lane, Judy. I have just moved to a new town, and I’m already feeling the loss of those I left behind. New chapters are exciting, and even for the best sometimes, but it can be difficult to turn that page. New York sure is pretty! We’ve loved our visits there. I’d return. I feel the same way about moving to Paris, Tracy. I loved it there. We’ve been there 4 times, but I also do not wish to live like Hemingway – as an expat. We’ve never been to Germany. My brother has and he totally would love to make a return visit there. 😉 Many places pull at us for different reasons. Great story Mom, I too miss New York and my friends who are still there…but I am taken back to those wonderful memories every time it talk to them. Love to you and Dave and my furry siblings! Will do. I will look at the link later. Look for my next blog this week. Grandkitties say mew mew. Thanks for sharing your nostalgic trip! Your memories are so tender. If I could go back it would be to my childhood home to see if I could recapture how I felt growing up. I think that would be fun, Dor. I’ll bet those memories would come flying back so easily. Years ago, when we were house hunting, I was disappointed that the house I grew up in had recently been for sale. My parents put a lot of time and money into making that old house more homey. I loved the window seat. It brings back great memories. I’d love to have one again that naturally fit into a room as that one did. Thank you for your comments. For my mother’s early-birthday treat, I brought a Boston Cream Pie, and the caregiver and I put candles in it for Mom to blow out! She especially liked the cream part of the pie, soft enough for her teeth. So glad that you enjoyed taking that walk with me, Marilyn, and delighted you enjoyed the post. It did trigger many happy memories for me. That Boston Cream Pie and candles was a real treat for us. I’m glad your Mom enjoyed her early birthday treat. Maybe you can’t go back permanently, Judy, but at least you can visit. Maybe what you have now is the best of both worlds. I would love to return to the Bronx of the late 1950s and early 1960s. The general location is still there, but the special places — and the people — are gone. Charles … The house I grew up in during the 1950s is in the same area. I didn’t think to go back and look at it this time. But I did years ago when we were first buying a home. I was disappointed that it had been recently up for sale. A grand old house with many wonderful memories. But, as you say, special places and the people connected to them are long since gone. You can go back, Judy, for a beautiful little while, to remember the great times with the special people. This is a marvelous post, for the memories from yesteryears and photographs from now. You and Dave have a good life, my friend, all these interesting years. 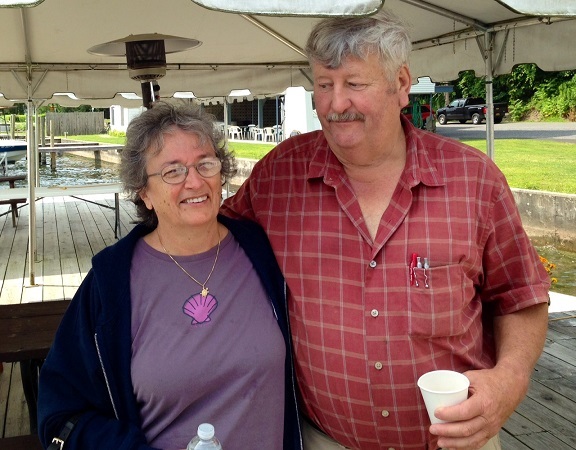 Karen and I were proud to be part of Homecoming Tour 2014. What a beautiful trip down memory lane! As I read your post, two aspects of you seem to jump out at me and I wish to acknowledge you for these. 1) Your ability to be in the present even when your past memories tug at your mind.Your observation of all that is occurring around and for you holds the capacity to take your reader there. 2) Your uncanny memory to remember all those small details from the years gone by. I do sense that the words you have written have emanated from your heart and such heart felt articulations have this quality of enveloping the reader with love and warmth. Thank you for the compliments. I’m pleased that you feel my observations hold “the capacity to take your reader there.” That is the writing goal I strive for. The way you captured my nostalgia senses, describing things and how they changed, that really got me a little teary-eyed. I have moments where I wish I could go back in time, to houses where my children grew up, or heavens, where I grew up… then I realize I like it now, where I am at. I liked how surprised we are when we hear how big our friends children have grown and their accomplishments, too. That was very sweet of him to bring you some personally candlelit pie, and singing to you as well! With service like that I bet his restaurant is busy!! 😀 I just looked up Boston Cream Pie, Wikipedia says it’s a cake, chocolate cake with a lot of cream … mm, I like that kind of cake. So next time I’m in a American style restaurant and I see that pie/cake I’ll have to give it a try! I can understand your mixed feelings with a place you once called home, it’s a strange thing that, our memories can be a real pull to want to return. I love the city I live in, even though it isn’t where I grew up, I’ve always felt totally at home from the moment of arriving. It has some wonderful ancient history mixed with ultra modern architecture, but so did the little village many miles away where I grew up, but it was such a dull lifeless place to live, not my kind of world! I’ve visited it on Google Street view a few times, and never felt emotional about the place, but if I visualize myself actually visiting I think it would be overwhelmingly emotional, which is why I never have. Maybe one day I’ll feel different about it. At least you have rational thinking that can see it would probably not be as great as one half of your emotions tell you. And being close to your family is so important. Some people do move back to places they’ve once lived, and it can be a real disappointment, things can look like they’ve not changed when in fact they have. My Dad visited his Irish village he grew up in when he was in his mid 50’s and it was sad, the village still looked pretty much the same, but not one person he knew remained. They had all left in their the 1940’s and 50’s just like he had. It was a sad day for him. Boston Cream Pie is a wonderful treat. I know you’ll love it. We really did appreciate Larry’s treat and thoughtfulness. When I looked back in my photos and journals, I was surprised to see this happened 21 years ago. I spent most of my life in Central New York. So there are friends from school, college, work, neighbors, people I knew in the community. So they know me thru the various stages of my life. When I moved, we didn’t have that kind of foundation when making friends. We don’t have the shared experiences, etc. Suzy, I can understand your father’s feelings when he returned to the village he grew up in. Dave and I both know that our neighborhood has changed. A beloved neighbor, who lived next door to us, died in April. People where we worked have moved on. So the workplaces have changed. The changing dynamics means, of course, you can’t return to the same place. Wonderful post, Judy, especially for an old Upstate New Yorker like myself. It’s a pity, and a bit of a mystery, really, how Upstate NY remains largely an undiscovered treasure. The NY State tourism bureau ran a campaign once that featured photos of natural wonders, with the tag line, “Where is this?” You’d be guessing anywhere from California to Virginia, but it would turn out to be somewhere in Upstate New York. I remember that pie story, and I understand that I’ll-never-forget-it magical feeling something like that brings. I was watching outdoor theater once– Shakespeare In The Park– when it started to rain. They were halfway thru the final act, so the players soldiered on. A lot of smart people had brought umbrellas– I was not among them. I was starting to get seriously wet, when a stranger held a blanket over my head and said with a big smile, “Use this.” I thanked him profusely at the end of the play. I’ve thought of his kind act many times, and it always makes me very happy. I knew you’d remember the pie story because you left a beautiful, hysterical response. Thank you for your comments, Mark.